It is still not time to hang up the waders and fly rods. Winter can be one of the most challenging yet rewarding times of the year to fish. Trout throughout the state slow their feeding patterns as the metabolism decreases. Another tough part of winter fishing is less than ideal conditions on the rivers. Flows are low, water temperatures are cold, and water is crystal clear. We are seeing these typical conditions across many of the flowing waters in the state. Tailwaters are still available for fishing and will keep rivers relatively ice free for varied distances downstream. Top release tailwaters are releasing much cooler water so the open water below does not extend very far. Bottom release tailwaters release warmer water in comparison and can keep rivers open for much longer stretches. Statewide we are really starting to see the canyon sections of rivers and streams with a lot of shelf ice that makes fishing very tough. Stretches of rivers that receive more sunlight throughout the day are staying open better but may have some slush flow in the mornings that will dissipate by around 11:00am. As of 1/23/2019, fishing for trout has been very good the bite has definitely moved to an early morning bite, before and as the sun is coming up. Trout are being caught in many different areas, some fish are being caught in all different water depths, the fish deeper seem to be suspended about 15 feet below the ice. Many different baits have been successful in catching fish. Large tube jigs on the bottom have been working along with spoons for the more aggressive fish. Kokanee Salmon are also being reported as good, look to the deeper waters to find schools of salmon suspended 15 to 35 feet below the ice. Heavier spoons have been working well, such as Kastmasters or Swedish Pimples. Northern Pike fishing has slowed however a few larger fish have been caught. As of 1/22/2019, ice at the reservoir has been reported between 14 and 16 inches thick. Fishing remains good for trout in the 16 to 19 inch range. There have also been reports of some much larger fish being caught. White and pink tube jigs tipped with waxworms or mealworms seems to be working well. Keep an eye on approaching storm fronts to change the barometric pressure and increase success. As of 1/24/2019, ice is being reported at 6-8 inches near the marina. There are some larger pockets of open water near the middle of the lake. The edges do have some open water from increasing water levels. The lake is about 5 feet down from full and slowly rising. Fishing report - not enough reports coming in for reliable information since ice conditions have only recently allowed fishing. The reservoir is closed to boating. The inlet is on and outlet is off. As of 1/21/2019, ice in the marina cove ranged from 5 to 6 inches. Fishing is good for trout using spoons or small jigs tipped with waxworms. Anglers have also reported success during the low light hours catching walleye in the deeper portions of the marina area. Reports of Yellow Perch and Crappie have been few and far between. As of 1/23/2019, Jackson Lake is completely frozen with 7.5 inches of ice in most areas including the boat ramp area and the dam. The inlet is also frozen with varying thicknesses of ice from 4 to 7 inches. Anglers are reporting success with walleye and saugeye along the dam immediately in front of the outlet house. Jigs and mealworms have been popular choices of bait. Jackson Lake will typically hold ice until the later part of February. As of 1/10/2019, the fishing remains fair for the warmwater species that inhabit Pueblo Reservoir. Smallmouth Bass can be caught by slowly working finesse presentations out on the deeper flats and deeper structure. Walleye fishing has slowed but fish are still being caught in deeper water using jigging minnows and jigging spoons. As of 1/17/2019, The lake is at 728 surface acres with a surface elevation of 6184.38. The lake froze over as of 12/28/2018 ice is 3 to 5 inches thick. South shore fisherman are catching trout on jigs tipped with mealworms or shrimp in depths of around 20 feet. This 762-acre impoundment is located off of E. Quincy Avenue, two miles east of E-470. As of 1/21/2019, current ice conditions range from 0 to 5 inches with the thickest ice in the back of coves. The east end of the dam is currently open for shore fishing. Please keep in mind that these conditions can change quickly this time of year and caution is advised. Fishing has been slow for trout and perch with a few reports of perch being caught. Some of the trout caught have been in the 3 to 4 pound range. January park hours: 7:00am to 6:00pm. For more information call 303-326-8425. This 881-acre impoundment is located in Cherry Creek State Park, in Aurora. There are two entrances to the park, the east entrance off S. Dayton St. and the west entrance off S. Parker Rd. As of 1/25/2019, ice conditions vary in areas of the lake but average ice thickness is around 7 inches. As always caution is advised and it is important to carry all safety equipment for a self-rescue if needed. Fishing has been fair for walleye with fish being caught on jigging spoons and Jigging Raps in 13 to 18 feet of water. The walleye bite seems to be best in the last hour before sunset. Fishing for panfish is fair to good fishing submerged trees or weed beds from 10 to 19 feet of water. Minnows and spoons seem to be most productive, the key is moving around until you find the fish. The best locations are where mudflats give way to deeper water and fishing right on the break lines. This 1,356 impoundment is located in Chatfield State Park. As of 1/23/2019, the majority of the lake was iced over with ice ranging from 3 to 8 inches. The ice on the south end of the reservoir is more solid and consistent compared to ice on the north end. As always caution is advised any time you are venturing out onto the ice. The fishing has been sporadic with some anglers catching decent numbers of trout on spoons tipped with waxworms or mealworms. Some really nice size trout are being caught. Anglers are reporting sporadic catches of Walleye, Smallmouth Bass, and Yellow Perch. As of 1/19/2019, 20 inches of ice with 3 to 5 inches of snow cover with drifting near the edges. The water clarity is great, and you can see all the way to the bottom! This past week anglers have begun reporting more success in the deeper portions, fishing 15 to 20 feet. There is still a large range of fish being caught with most fish between 14 and 19 inches. Lures that have been producing waxworms, mealworms, and small jigs with plastic tails tipped with a waxworm, and gold spoons. As of 1/19/2019, North Delaney: 20 to 22 inches of ice with 3 to 6 inches of snow cover with drifting near the edges. Fishing feedback seems to be slow. South Delaney: 20 to 22 inches of ice with 3 to 6 inches of snow cover with drifting near the edges. Feedback on fishing is that south is active for 14 to 17 inch fish. We know the HD Ice lure in the ghost color is working well here. As of 1/22/2019, currently anglers are reporting catching rainbows in the 16 - 18-inch range on waxworms, mealworms, and ice jigs. The lake has approximately 12 to 16 inches of ice, however, please always use caution when accessing the ice for fishing. The south road is closed for the season. We have approximately 3 feet of snow on the ground. The Visitor Center is open 7 days a week from 8:00 a.m. to 4:00 p.m.
As of 1/5/2019, the reservoir recently froze over with 3 to 8 inches of ice being reported. Always use caution when fishing on the ice and be sure to fish with a buddy. Ice conditions can vary greatly across the lake so it is important not to let your guard down. Fishing has been good for pike and trout being caught throughout the lake. Bass fishing has been good near the Cedar Campground as well as near the dam. As of 1/22/2019, ice fishing has been productive. Anglers are reporting a lot of success catching rainbow trout using small ice jigs tipped with waxworms, or mealworms. Anglers have also reported some catches on a variety of jigging spoons. Productive areas have been near the inlet or in both Keystone and Morrison Coves. Ice conditions vary across the lake with most places being at least 6 to 8 inches thick. Always take caution when traveling across the ice. As of 1/24/2019, ice has been making its way from the Iola basin west to about Elk Creek Marina, recent reports are that the Elk Creek Marina area now has fishable ice. Along with that ice is continuing to form farther west down the length of the reservoir. Reports are that the Cebolla Basin has around 6 inches of ice and there is also 6 inches of ice reported all the way to the Highway 50 Bridge. The lake is expected to fully cap this winter with cold temperatures and low water levels. Really good reports of trout are coming in and a few lake trout have been caught through the ice in Iola Basin as well as Elk Creek. 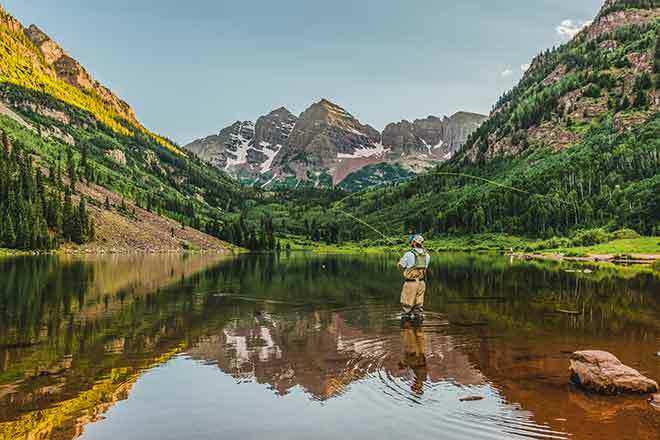 Anglers are catching trout off of chartreuse colored jigs tipped with mealworms and gold minnow baits at about 10-15 feet of water. Now that ice has formed in the deeper areas of the lake, look to start using tube jigs in the white, pumpkin seed or even green colors to fish for the lake trout. Check in with a local tackle shop to get the latest ice conditions as they will change daily. As of 1/5/2019, ice is about 8 to 10 inches thick, but as water is rising in the reservoir, it is breaking away from the edges and it can sometimes be 5 feet from shore. Early morning is not usually a problem, but getting off the ice later in the day can be tricky. Please use the buddy system, wear a life jacket and drill test holes along the way. Fishing reports are coming in of anglers catching catfish, perch, crappie, pike, and bass. As of 1/21/2019, the lake is capped with about 8 inches of ice. Anglers are reporting some slushy and snowy conditions. Fishing for smaller lake trout has been fair using darker colored tube jigs as close to the bottom as you can jig them. Some trout have been caught suspended off the bottom. Look to the east part of the reservoir for pike fishing as there are some large pike present in this reservoir that will slide up shallow as spring approaches.